Last month when the Vols beat Kentucky in the tournament I happened to be in San Jose for a preds game. Some sharks fans actually yelled Go Vols at us because I was wearing my Tennessee beanie there. Heard it in Banff, Lake Louise, Eugene OR, Penobscot ME, DR, Yosemite, Leadville, and Frog Level. My wife and I were in Spain walking the Camino de Santiago - a 1000 year old pilgrimage route across northern Spain. We were mid way on our two week 200 mile hike when a young guy from Lithuania spotted my wife’s power T windbreaker. We were the only three people for miles on a dirt trail and we hear “Go Vols!”. Turns out that he had been an exchange student in Knoxville. He loved UT football and the beautiful coeds. We talked for the next several miles before he left us in his dust — we are vintage Vols. While I was “voluntarily” committed to the asylum. Djibouti, Kandahar, and even tiny Diego Garcia.........there always seems to be a fellow military Vol everywhere I’ve gone. We definitely represent the Volunteer spirit well. craziest place was for me in Indiana I was there working for 4 months and went to a Monday night WWF show. I of course wore my UTK gear , it was an awesome time! But 2 years ago I got a Go Vols in El Nido, Palawan. VolNavy01.....You have been to some strange places...only in Djibouti a short time..thankfully, and people need to Google Diego Garcia...just for the geography knowledge. I spent 2.5 years in Timor Leste, only one grocery store on the island and ran into a Lady with a T purse. She was a teacher for the UN... We are a VOLNATION! We go to Litchfield Beach in SC. I know that is not a crazy place to run into Vol fans, but, I will my block "T" cap around specifically to get a "Go Big Orange! "or a "Go Vols!" Sure enough, I get a response like that every year! 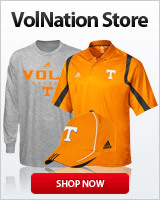 There are Vol fans all over the world! Couples Ocho Rios, Jamaica mon! And we got the whole pool bar singing Rocky Top all day! We still keep in touch with the Tennessee Vols couple we met. When I first moved to North Carolina, I was going down some back road to a Walmart one afternoon. I have a front plate with a Power T on it and some man in an SUV approaching me hit his breaks real fast, rolled his window down, pointed at the front of my car, yelled “GO VOLS!”, gave me the thumbs up, and then drove off. It was in Mooresville. Don’t you live near Lake Norman?? It was in Mooresville. Don’t you love near Lake Norman?? Just noticed last night at Tropicana Field that going up the escalator from the lower entrance of the 100 level to the main level on the Left field side of stadium. There is a picture of a UT fan that appears to be Scotland along the right hand side of the rail. Unfortunately given the Rays attendance not many others have seen it. Always hear a Go Vols each game. On Green Turtle Cay in the Abacos! We were staying next to a house named Tennessea Turquoise, which was decked out all Vols! I loved every minute of it—spouse is a GA Bulldog fan. The owners came by on the golf cart and gave us a Go Vols!!! On Green Turtle Cay in the Abacos! We were staying next to a house named Tennessee Turquoise, which was decked out all Vols! I loved every minute of it—spouse is a GA Bulldog fan. The owners came by on the golf cart and gave us a Go Vols!!! Oh yeah and the Appalachian Trail.